Portek Skybird Bird Scaring Rockets. 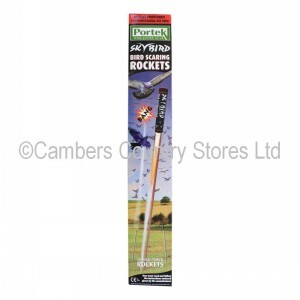 SkyBird agricultural bird scaring rockets are the ultimate deterrent to clear away birds in response to a very loud bang overhead! SkyBird bird scaring rockets are designed to clear away birds in response to a very loud bang overhead. Launched at an angle of approx. 45°, by an out-of-view operator, the unexpected loud mid-air explosion ensures non return for many hours - especially if reinforced by a second rocket set off very soon after the first. Birds become accustomed to all conventional bird scaring equipment if regular changes are not made in location and timing. Skybird Rockets are best used, not as a substitute for other methods, but to enhance their effectiveness by introducing a new element of shock and surprise.